Some of the members of the previous DigitalCity Fellowship Accelerator cohort. 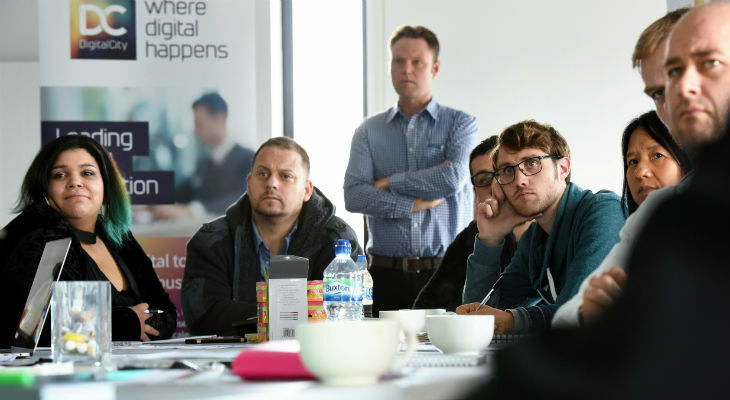 DigitalCity Fellows benefit from a programme of workshops and bespoke mentoring, as well as a grant of up to £5,000.The programme is designed for early-stage businesses who have been trading for less than 12 months. As the wider sectors continue to embrace digital technology, the diversity of the businesses DigitalCity supports is expanding. The most recent programme included companies providing digital solutions to problems in the areas of health and end of life care, live music and space technology. The Fellowship Accelerator Programme will be delivered in Boho 5 on Bridge Street East, Middlesbrough, from February – April 2019.